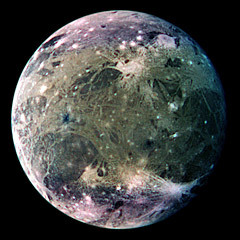 Ganymede [GAN-ee-meed] is Jupiter's largest moon and is also the largest moon in the Solar System. With a diameter of 3,280 miles, it is actually larger than the planet Mercury, but contains only half its mass. It is much larger than Earth's moon. At this size, it would be classified as a planet if it were orbiting the Sun instead of Jupiter. Ganymede gets its name from a young Trojan boy in Greek mythology, who was made cup-bearer to the gods by Zeus. 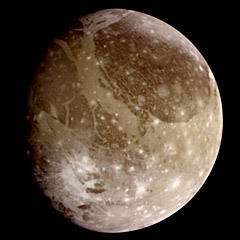 Ganymede was discovered by Galileo Galilei and Simon Marius in 1610. It is one of four moons discovered by them. These are commonly referred to as the "Galilean" satellites. They are so large and bright that they can be seen with a pair of binoculars. 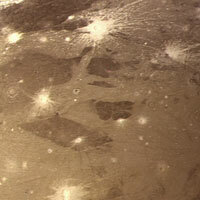 Ganymede's surface is similar to that of Earth's moon in that is composed of two types of terrain. About half of the surface is old and cratered while the rest consists of much younger, lighter regions. Some of the craters even exhibit rays of ejecta material. Unlike the Moon, however, craters on Ganymede lack ring mountains and central depressions. 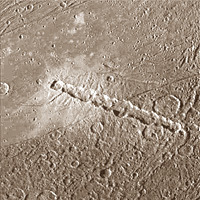 Astronomers believe this is caused by the icy surface flowing over time. 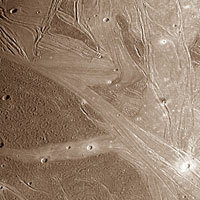 The younger regions are marked with grooves and ridges. These are believed to have been formed by tectonic forces very similar to those that shape the surface of the Earth. For this reason, some astronomers believe that Ganymede is more closely related to the Earth than Venus or Mars are. The Galileo spacecraft discovered that Ganymede has its own magnetosphere embedded inside Jupiter's. Scientists believe it is generated in a process similar to Earth's, by the motion of conductive material in the interior. This makes Ganymede the only moon known to have a magnetosphere. 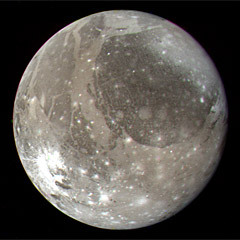 Astronomers believe that Ganymede has a molten iron or sulfur core. This core is surrounded by rocky material with a frozen icy crust on top. This crust is believed to be formed mainly of water ice. Ganymede was long thought to have no atmosphere, but recent discoveries by the Hubble space telescope suggest that the moon may have an extremely thin oxygen atmosphere similar to the one detected on Europa. The Hubble detected ozone near Ganymede's surface. The ozone is produced as charged particles from Jupiter's magnetic field collide with the surface of Ganymede. As these particles penetrate the moon's surface, water molecules are disrupted leading to ozone production. Even though Ganymede may have an oxygen atmosphere, it is believed to be far too thin to support any form of life.